A rifle bullet was sent to Ozawa' s office. | Hey, you know what? ホーム > スポンサー広告 > A rifle bullet was sent to Ozawa' s office.ホーム > Ozawa > A rifle bullet was sent to Ozawa' s office. A rifle bullet was sent to Ozawa' s office. According to the Yomiuri Online News, a rifle bullet enclosed in an envelope was sent to the secretary general of DPJ, Mr. Ozawa's office around at 11:40am, on December 25th. Immediately an employee at his office reported the case to the police station. The bullet is identified a size of one diameter and 10centimeter length. The police announced that the bullet was enclosed in a small sized envelope and was put into a larger sizesd envelope. On the envelope, it was written as “To Mr. Ozawa". His accurate office address was also written. There is a possibility that the bullet was sent around on 20th in December, from one of 23 Tokyo wards. Now I'd like to tell Mr. Ozawa. 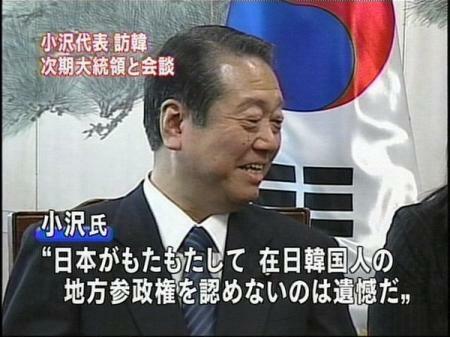 “You don't represent as a true Japanese politician for Japanese people”. You once said, "I want to become a military general of China" in front of Fu-Chin-Tao when you went to China with over idiot 143 DPJ politicians and its supporters-total of more than 600 idiots just to take a snap photo of individuals with Fu-Chin-Tao. This is a Sean that a lot of protesters are trying to get into nearby Ozawa's residential area.